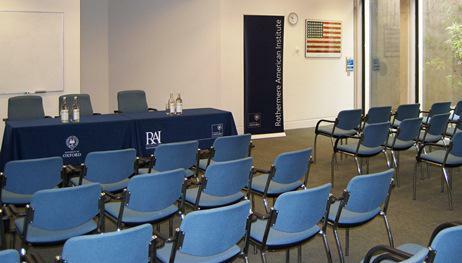 The RAI has two seminar rooms on the garden level available for hire. One room is set up ‘conference-style’ for approximately 20 people, and the other can accommodate up to 60 people ‘lecture-style’. 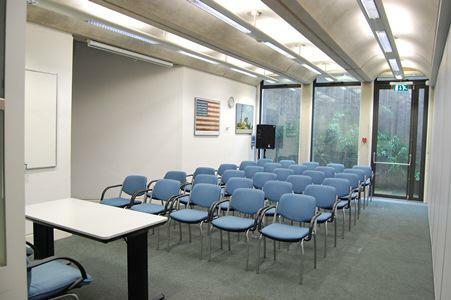 The larger of these rooms can be split into two smaller rooms; alternatively, both rooms can be joined to create one large room to accommodate a maximum of 100 people ‘lecture-style’. There is also a common room area which can be used as breakout space and for refreshments. Please see the full room hire policy (right) for details on facilities and charges (subject to VAT if applicable). Full A/V provision and wireless internet is available by prior arrangement at no extra charge. Discounts are available for University of Oxford bookings. There is step-free access to the seminar rooms via a lift in the foyer (entry doors are 31 inches/69 centimetres wide). Once you reach the garden level, there is a short walk to the seminar rooms (approximately 60 feet/18 metres to the small seminar room and 72 feet/22 metres to the large seminar room). For more information, or to request a booking, please contact enquiries@rai.ox.ac.uk or telephone 01865 (2)82705.